The city of Harrisburg has seen some things in its 200 or so years. Everything from civil war to bankruptcy, in fact. 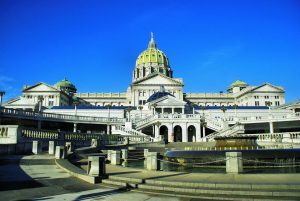 Harrisburg has seen some rough times, but hopefully things are changing for the better. Not only for the citizens of Harrisburg, but her businesses too. And this is where SEO companies like ours come in. Because fertile ground for economic growth doesn’t just mean growth – it means competition too. But how can you stand out from your competitors? A website is a great place to start. Did you know that 29% of small businesses don’t have websites? With the amount of shopping and business done online nowadays, it is hugely disadvantageous to be without a website. According to a recent survey, 96% of Americans shop online (with many preferring to do so)! But it cannot just be any website – bad websites are in some ways worse than nothing. Because while you may have a presence online, your brand becomes associated with a terrible website and your credibility suffers. Such is the world we live in today. This is where good web design and SEO come in. SEO, or Search Engine Optimization is the process of optimizing a website so search engines like Google can find it easier. But what do we mean by “optimizing” here? Simply put, this involves ensuring your website is accessible, has good content, and that it’s in a “good neighborhood”. There’s a lot more to it, but those are the basics. SEO is how you stand out from the crowd. It’s how you make search engines “like” your site better, and reward you with higher rankings in the search results. In the world of SEO, it’s good to have a local company take care of your business online. Local companies understand you, your business, your region, and your customers better. We already know the local market. Any good Pennsylvania SEO company would do okay, but a dedicated Harrisburg SEO company is always better. If you’re looking for a Harrisburg SEO company to help grow your business, why not check out Misfit Interactive? We’re local, flexible –and as you can see from our testimonials – do great work. Contact us for a quote today!